Veteran Demaryius Thomas, who is coming off a season-ending Achilles injury, signs a one-year deal with New England worth up to $6 million. 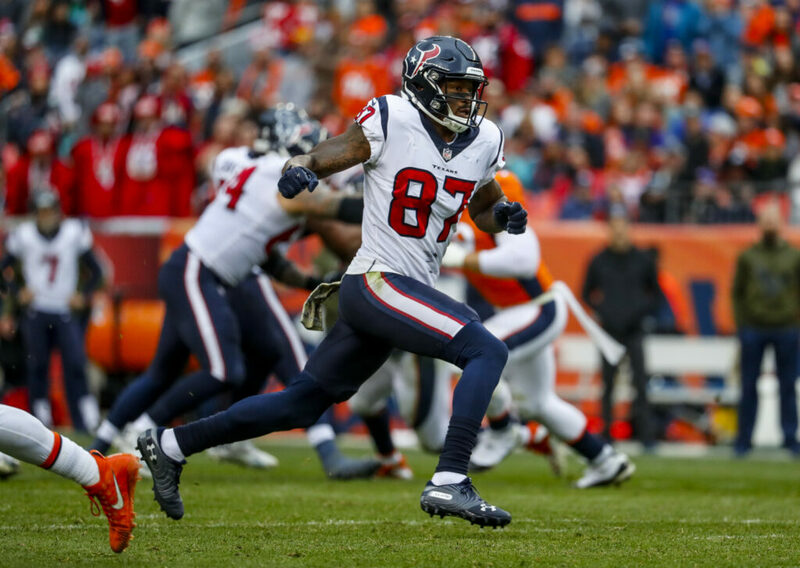 The New England Patriots gave a boost to their receivers ahead of next week’s draft by signing former Broncos and Texans wideout Demaryius Thomas to a one-year deal on Tuesday, according to multiple reports. Thomas, 31, is coming off a torn Achilles, but is a four-time Pro Bowler and signed a contract worth up to $6 million. The guarantees on the deal are not yet known. The 6-foot-3, 229-pound Thomas was a pivotal part of some record-breaking offenses with Peyton Manning in Denver. From 2012-15, Thomas averaged 101 receptions for 1,447 yards and 10 touchdowns per season. The Broncos dealt Thomas to the Texans at the trade deadline this past season. He ruptured his left Achilles in a Dec. 23 loss to the Eagles. He’ll be seven months removed from the injury when the Patriots open training camp. DOLPHINS: Two-time Pro Bowl safety Reshad Jones skipped the first practice Tuesday under new coach Brian Flores, who declined to specify a reason for the absence of the team’s highest-paid player. Flores, hired in February after the Dolphins fired Adam Gase, said Jones has been attending meetings and remains part of the team. BEARS: Tight end Zach Miller decided to retire after nearly losing his left leg on a gruesome play two years ago. He had nine surgeries to address his injuries after he dislocated his knee and tore an artery on Oct. 29, 2017. He had left open the possibility of playing again up until announcing his retirement on Tuesday. FALCONS: Atlanta signed offensive lineman John Wetzel to a one-year contract and defensive end Chris Odom to a two-year deal. JAGUARS: Coach Doug Marrone has no plans to punish running back Leonard Fournette following his arrest for driving with a suspended license. CHARGERS: Los Angeles will wear its historic powder-blue jerseys as the primary home uniforms in the upcoming season.